Our affordable virtual seminary-level courses are designed their language and cultural context, right where they live and serve so there’s no need for them to spend years away from their families and congregations—something cost and logistics would make impossible for most anyway. Pathway Learning doesn’t just train, we evaluate. At each step along the process, the learners are evaluated for comprehension both on-line and by a cohort of their peers. And we do the same for ourselves. At Pathway Learning, we are constantly evaluating our methods to see what adjustments we might make to better serve our students as well as strengthen our future direction as a ministry. By the Numbers: we have over 377 users, plus those who don’t have access to the Internet. 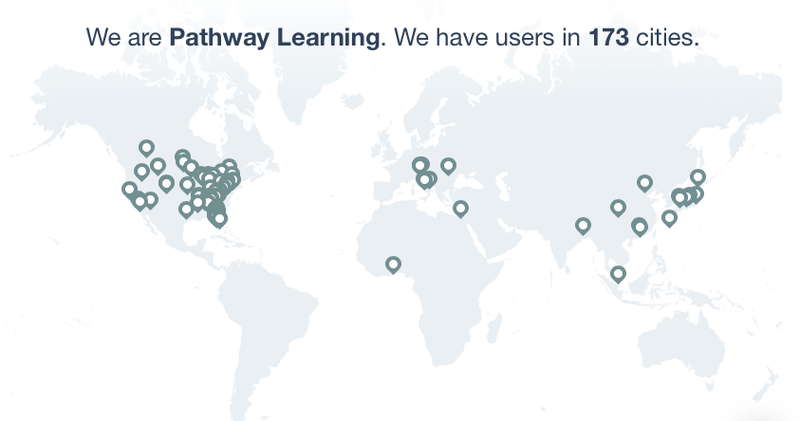 That's students in 22 countries around the world! Now, we’re ready to scale up. We’ve translated English courses into French, Mandarin, Italian and have taken French speakers in West Africa and Mandarin speakers in East Asia through the courses. It is time to see our impact start to grow exponentially. • For those of you who are able, pray about giving a stable source of revenue. That might mean monthly or even multi-year giving. •Be willing to fund things that aren’t all that glamorous but 100% critical—things like salaries and electric bills. Consider an unrestricted gift to Pathway Learning to help us pay for additional staff and resources absolutely necessary to grow our impact. Tell your friends about us. Help us network within your networks. Consider introducing us to other funders or partner organizations. At Pathway Learning, we take stewardship of money and time seriously. Because we understand that while you give your money and we give of our time, at the end of the day, the money, the time, both are God’s. Please join us in giving thanks to God for how he has already blessed Pathway Learning through the prayers and giving of his people to this point. And we commit to you to be careful stewards of both money and time given in the year to come. • Launched training in North American, partnering with Perimeter Church in Atlanta and others. Pathway Learning helps under-served church leaders develop churches that transform lives and communities through effective ministries of evangelism, discipleship, and acts of mercy and justice. When you are a poor pastor from a poor area, it is nearly impossible to even dream about leaving your family, your paying job and your congregation to go abroad for two or three years to study the Bible in a language that you sometimes don’t understand. How do we know we’ve done what we set out to do? At Pathway Learning don’t just train pastors and church leaders from resource-poor areas, we evaluate what they’re learning and how well they’re able to put those skills into action. . Using proven adult teaching methods, at each step along the process, the learners are evaluated for comprehension both on-line and by a cohort of their peers. And we do the same for ourselves. At Pathway Learning, we are constantly evaluating our methods to see what adjustments we might make to better serve our students as well as strengthen our future direction as a ministry.